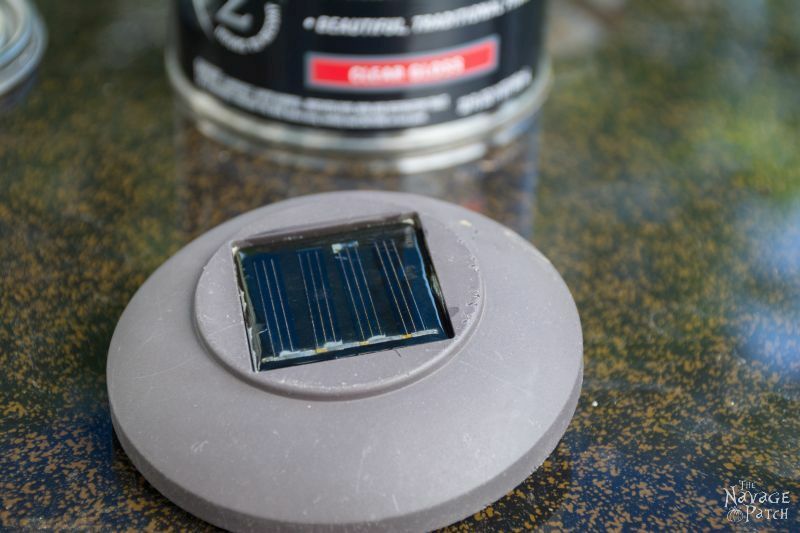 Inexpensive solar landscape lights are great, but they suffer from two major flaws: broken ground spikes and clouded solar panels. 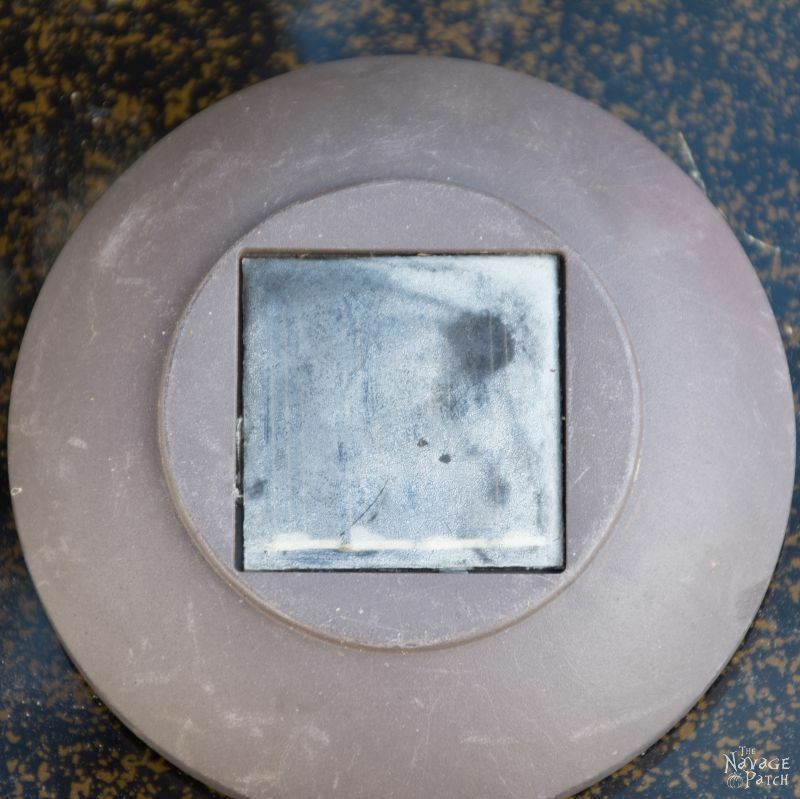 In this post, we’ll show you how to upgrade those cheap lights into DIY Cedar Cube Solar Landscape Lights, and we’ll show you a simple trick to clear up those hazy solar panels. 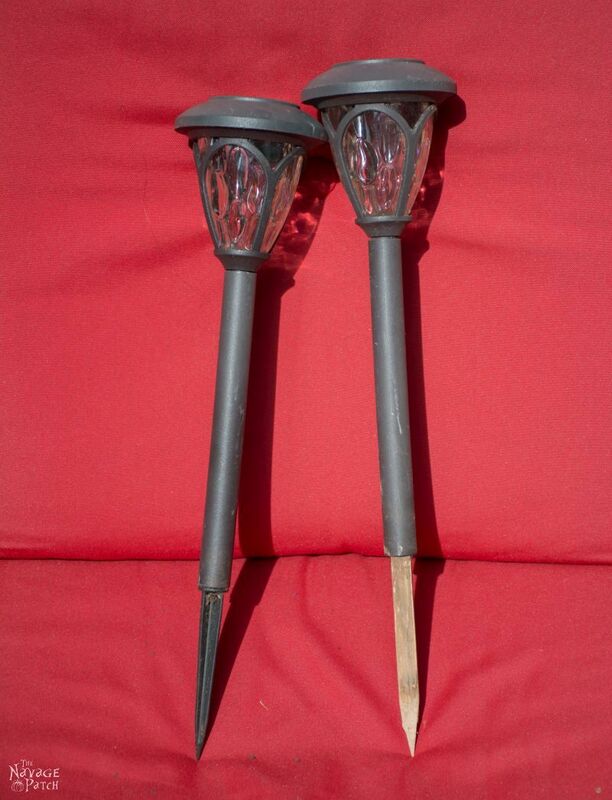 If you’ve ever bought inexpensive solar landscape lights from Home Depot or Lowe’s (like 6 for $14 kind of inexpensive), you’re probably familiar with their Achilles heel: the cheap plastic spike that sticks into the ground. The photo above depicts a rare specimen whose stake has survived a whopping three years. This is akin to a 300 year-old Galapagos tortoise. The problem of premature breakage and lost spikes has plagued all but the remotest and most forgotten of our lights. Don’t like where you put that light? Want to move it, do you? Well here’s your shaft, but the spike stays in the ground! Not watching where you’re going? Leg brushed up against the light? That’ll be a broken spike! Dogs got into your garden? Ran into one of the lights? You better believe that spike’s a goner! To sum up: Lights: good. Spikes: cheap Chinese crap. Between the Mostly Excellent Light and the Spike of Counted Sorrows lies the Shaft of Mediocrity. Meh, it doesn’t care one way or the other if it lasts three days or three years. It sits there in the ground, mostly good, but then it may decide to crack or split or calve off a rounded bit of itself like a Greenland glacier birthing icebergs in summer. Between our squirrel-mad dogs rampaging through the landscaping and my oafish galumphing, it’s a wonder any spikes survived. However, those few unlucky survivors were quickly and efficiently dispatched during Handan’s frequent and unpredictable changes-of-heart concerning design elements and lighting placement. One spring, Handan suggested I fashion new spikes from cedar to replace the lost Spikes of Inferiority. Down into my lair I went and returned with enough cedar stakes to slay several platoons of vampires. But the undead would have to wait, as these spikes were for the soil, not cold, unbeating hearts. They worked well…for a year. But then, a few of them started to snap when we moved them. Mostly though, they remained strong and resolute – so much so that the Shafts of Mediocrity began to shatter like the adolescent delusions of Millennials entering the real world after two decades of moonbeams, snowflakes and unicorn poop. 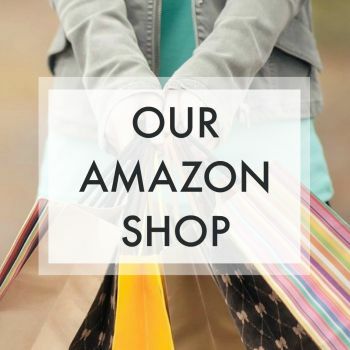 Before we go any further, be sure to follow us on Pinterest, Facebook and Instagram, and click the subscribe button at the top of this page to sign up for our email list so you’ll never miss a post! 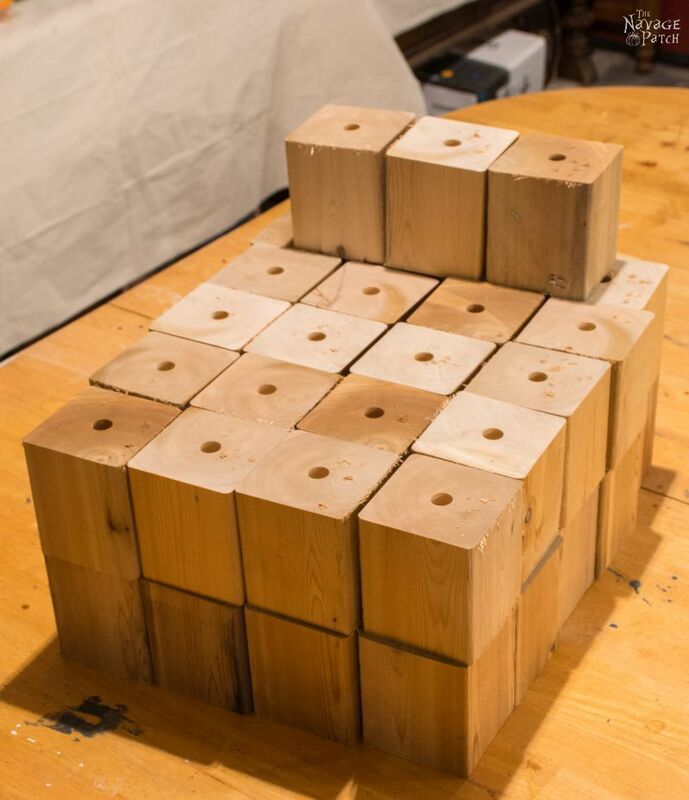 DIY Cedar Cube Solar Landscape Lights – The Final Solution! After all the time and effort we put into the landscaping around the pond, we needed a solution. As always, Handan hit upon the answer while I was off chasing bugs and chuckling like a dunderhead. Her idea was to get a few cedar 4x4s and cut them into 4 inch cubes. 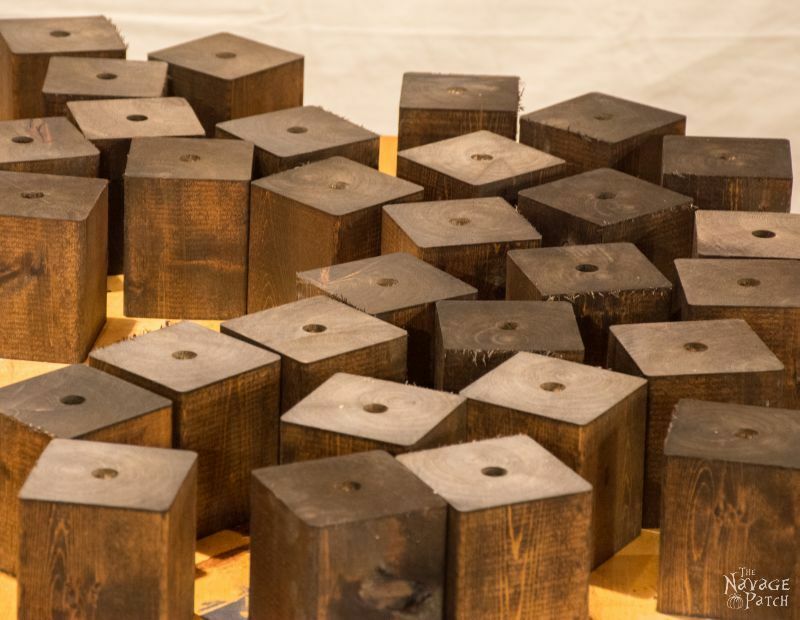 Let me clarify: her idea was for me to get a few cedar 4x4s and for me to cut them into 4 inch cubes. Next I needed to drill holes into the tops of the cubes into which the lights would fit. I measured the diameter of the protrusion at the bottom of one of the lights: 11/16 inch. Really? This kind of drilling is best done with Forstner bits – and I have two full sets of them, ranging from 1/4 inch up to 1 1/2 inches. But guess which size I didn’t have? That’s right! Gold star for you! I didn’t have 11/16 inch, so off to Amazon I went and ordered one. When it arrived, I got to work. 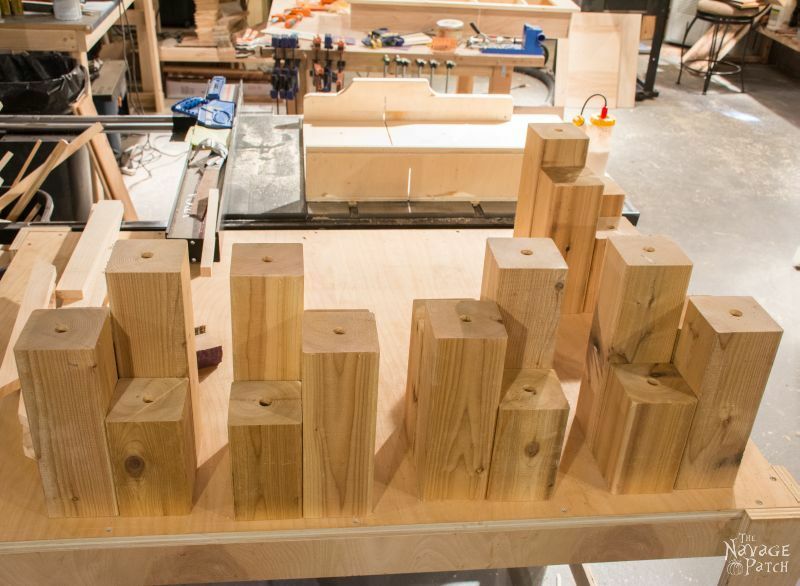 I used my drill press and set up stop blocks, so I could quickly position each piece. I set a vacuum just above the piece, since Forstner bits create whole ecosystems of wood shavings and debris. 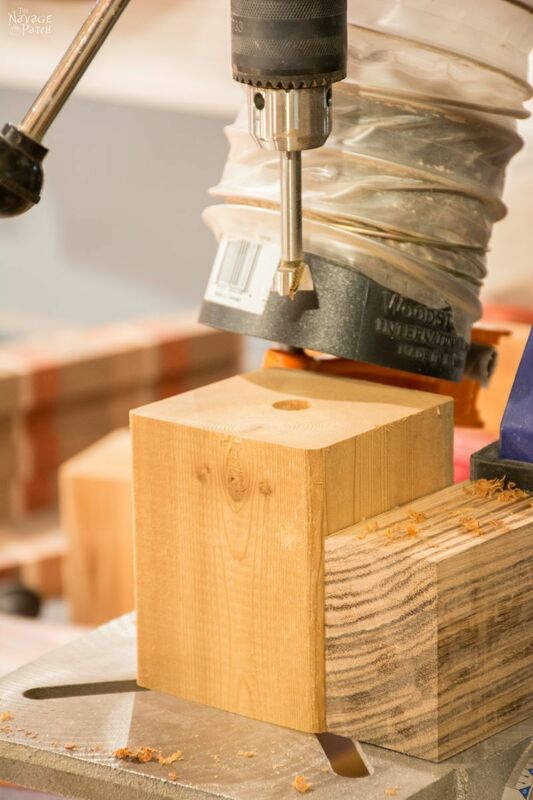 Then I drilled the cedar blocks, having set the depth of the drill press to the length of the protrusion at the base of the lights. Handan wanted me to stain the blocks, but as I am inherently lazy, I immediately countered her request by telling her how cool and New Englandy the blocks would look after a year in the elements. She was having none of it. I then got to work building the pillars. I made groups of four and glued them together. Then I stained them in the same manner as the blocks. When the stain had dried, we were ready to give them their lights and place them in the garden, but before we get to that, I want to tell you about another problem these lights suffer from: solar panel degradation. Since the panels are made of plastic, after one year in the elements, the plastic begins to haze. After two or three years, the plastic yellows and warps. It’s a wonder any light at all manages to get through. The efficacy of the solar panels to charge the batteries is severely impacted. 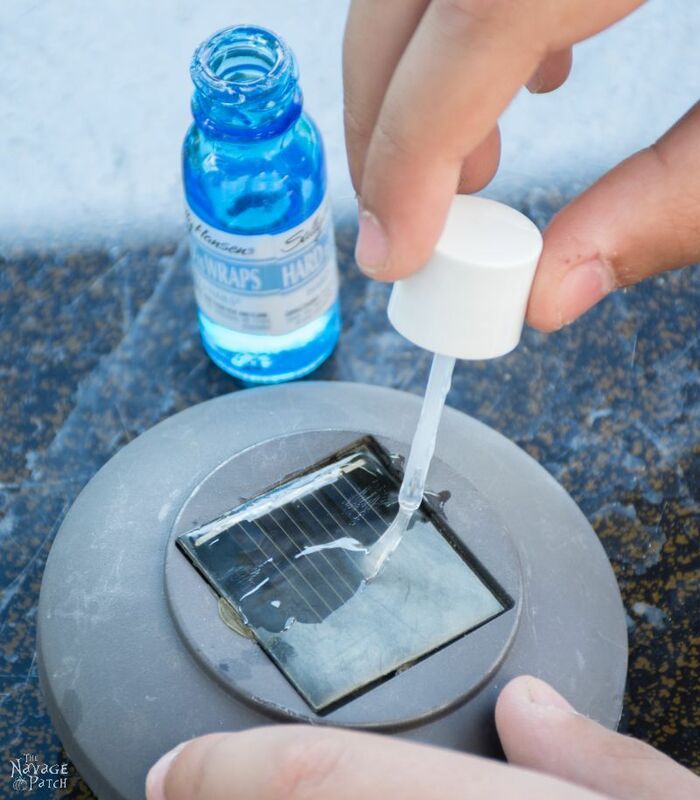 I had read that people were using clear nail polish to cover the solar panels. This seemed reasonable to me. 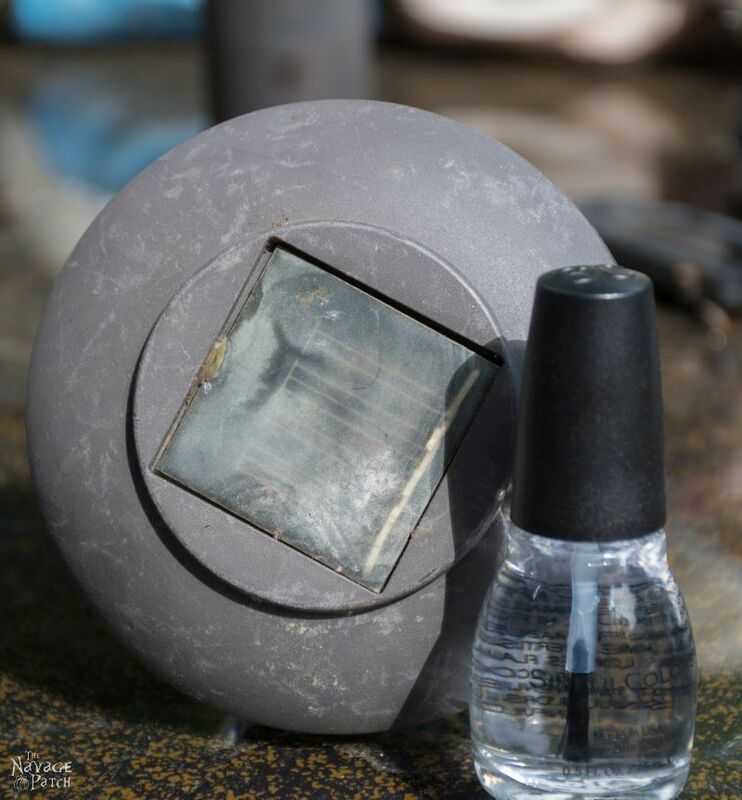 Nail polish is kept in solution with acetone – that’s the nasty smell. It’s also what nail polish remover is made from. Acetone is one hell of a good and nasty solvent. It will melt plastic with ease (which is exactly what it’s doing in that nail polish bottle). Well, if nail polish worked to restore the panels, and nail polish is mostly acetone, I wondered if straight acetone would also work. It would certainly be cheaper, as one gallon of acetone costs about $15, whereas one gallon of clear nail polish would run about $2700 (not kidding, I did the math). I went to the basement and grabbed my can of acetone, some cotton wipes and a pair of nitrile gloves (acetone is a really nasty organic solvent – it’s a wonder it’s legal for beauty use – oh wait, no it’s no wonder at all. Our government has a long history of green-lighting dangerous products, especially women’s beauty products, but that’s off-topic). It did a beautiful job of melting away the imperfections, and while it was still wet, it looked great. But acetone is incredibly volatile, which means it evaporates quickly. Because of this, it leaves the surface of the plastic totally matte. It will still allow light to pass, but not as much as a clear or shiny coat. 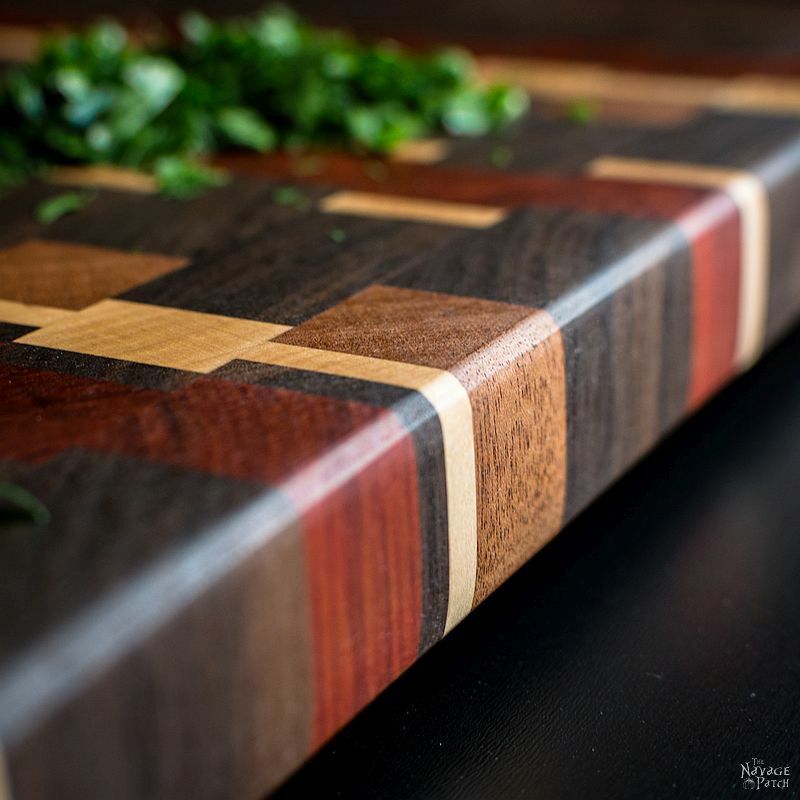 The whole point of a matte finish is to disperse the light waves in all directions. We want light to travel through to the solar cells below. Okay, so acetone wasn’t the best solution. What else could I try? 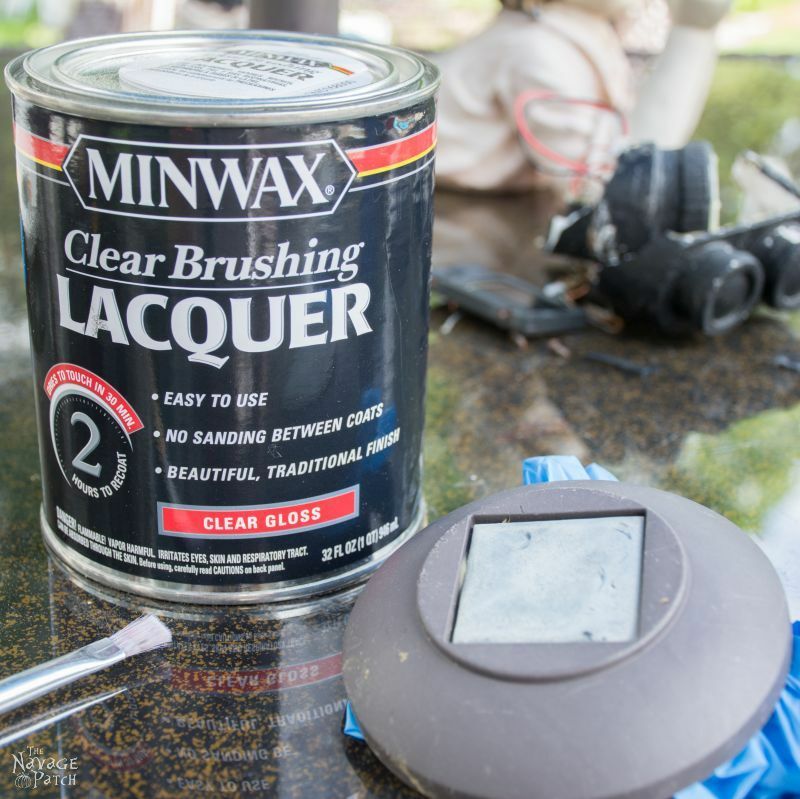 I remembered I had a can of lacquer in the garage, leftover from my umpteenth attempt at finishing an antique dining table we picked up at a tag sale a while back. Hey you want to see something pretty awesome? 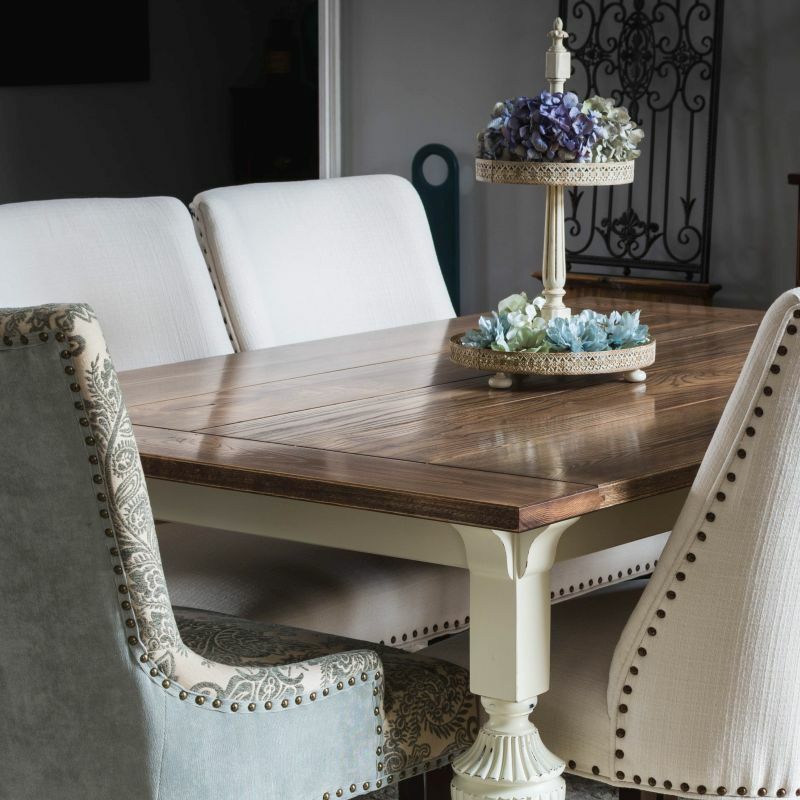 Click the picture below to check out what I finally did with that antique dining table! Anyway, I went and got the can of lacquer. If you think acetone is gnarly stuff….hooooooey! Lacquer makes it seem like roses in comparison. 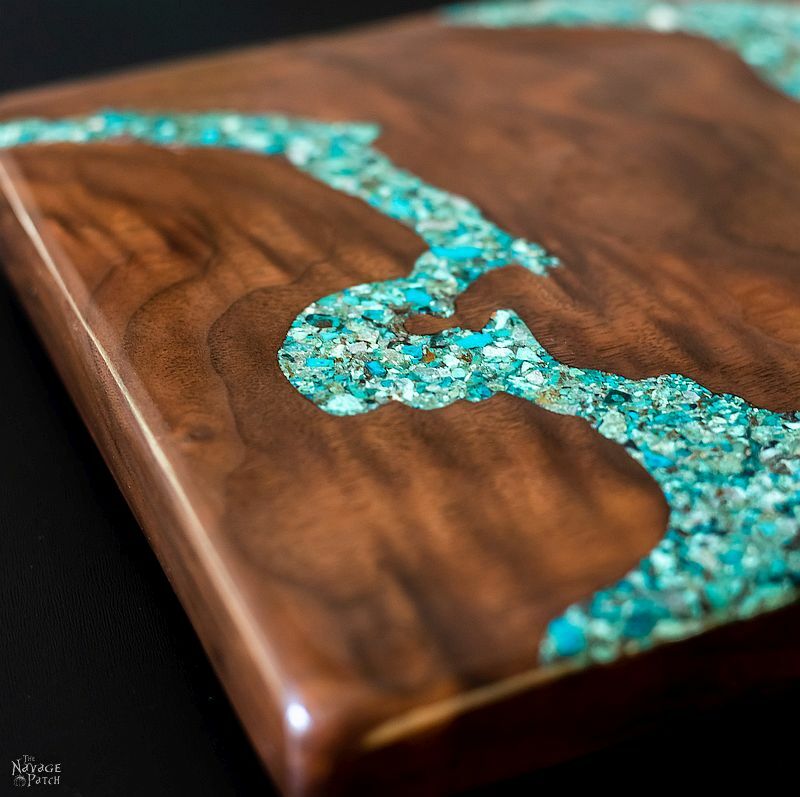 Do NOT use lacquer indoors! I knew that lacquer could also melt plastic, and it would leave a shiny coating, so I grabbed a brush and got ready to try. Oh, what a joy this was! It was like melting butter with a blowtorch! Look at that! Perfectly melted. But…what’s that white spot? Did I apply so much lacquer that it completely melted through the plastic and started to eat away at the solar cell? Since I couldn’t see the panel through the haze before I started, I couldn’t be sure. I decided to lacquer another panel, being careful to use less. It turned out great. 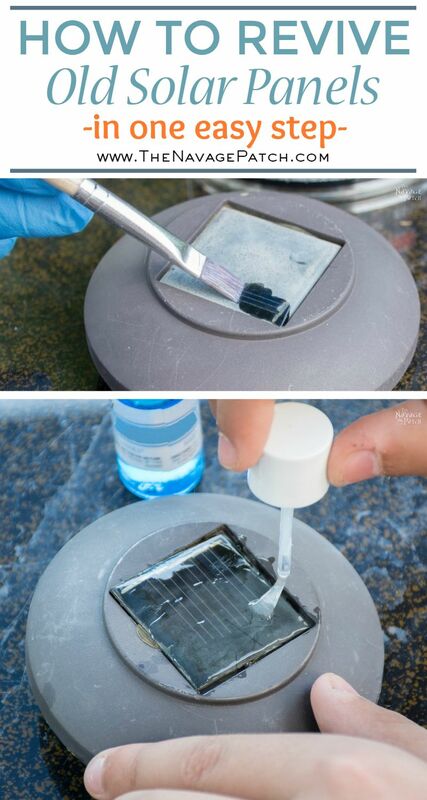 I decided to experiment on the two panels that seemed like the solar cells may have melted. I installed new rechargeable batteries that I had drained the charge from, then exposed the panel to the sunlight. The batteries recharged fine. I’m still unclear as to whether I melted the cells or not, but applying lacquer with a lighter touch solved the problem. The lacquered cell was shinier than the acetone, but not as shiny as the pics I saw of people using clear nail polish. I thought that I could up that shine with another coat, but I wanted this process to be quick, as we have over 100 lights all around the yard. Cost per gallon: about $50. Much cheaper than nail polish! Next I wanted to try nail polish, so I went to the drug store and started rooting around in the cosmetics section. I may as well have been a donkey shopping in an electronics store for all I understood in that vibrant and sparkly aisle. I was rather unwashed and smelly, having come straight from yard work, and I must have appeared to the female patrons of that aisle like some sort of barnyard animal rooting through a buffet table. At last I found a real bargain: two bottles of clear polish for $3. In fact, the deal seemed a little too good to be true, since all the other bottles were in the $6-$9 range for one measly bottle. Whatever, I grabbed the cheap stuff and galloped to the register, braying as I went. My hopes weren’t high, as “you get what you pay for” kept running across my mind. I was right. This is how it looked after I painted it. No difference. What the hell was that stuff? No wonder it was two for $3. My mom gave me a bottle of Sally Hansen clear nail polish so I could try again. This time, it worked. For this experiment, I was able to employ the services of my minion. Oh, didn’t you know I had a minion? Indeed. He’s currently on summer vacation, thus haunting my workspaces. Now that he’s practically 13, I feel okay mentioning him in the blog. Handan and I aren’t ones to plaster our kid all over the internet, so you probably haven’t seen him before. His name is Barish, and he’s my step-son, but from now on and forevermore, he will be referred to as my son, because that is how I see him. And as every tradesman must serve an apprenticeship to a master, every son must serve a minionship to his dad. Not bad, not bad! The finish was clear and glossy, though the nail polish didn’t completely melt the plastic, as you can still see some haze underneath the gloss. The Verdict – Which Product is the Best for Clearing Hazy Solar Panels? I’m torn between the nail polish and the lacquer, but I’m leaning towards the lacquer. 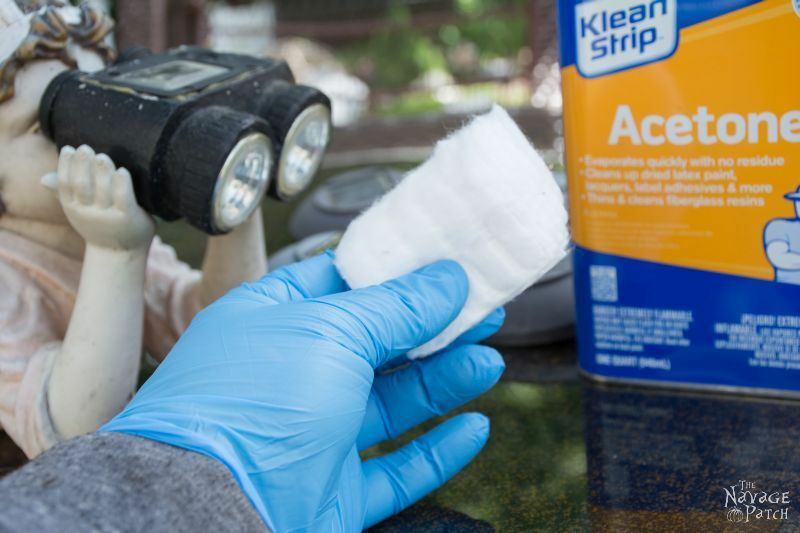 It is cheaper and quicker to apply, but it requires nitrile gloves and good ventilation. Okay now that we’ve learned how to revive our faded cells and now that you’ve met my minion son, let’s get back to those cedar cubes and pillars. The best part (aside from their handsome and distinguished looks) is that when my clumsy feet or the dogs’ frantic paws knock these lights over, nothing breaks! We need only to right them, then all is well again. 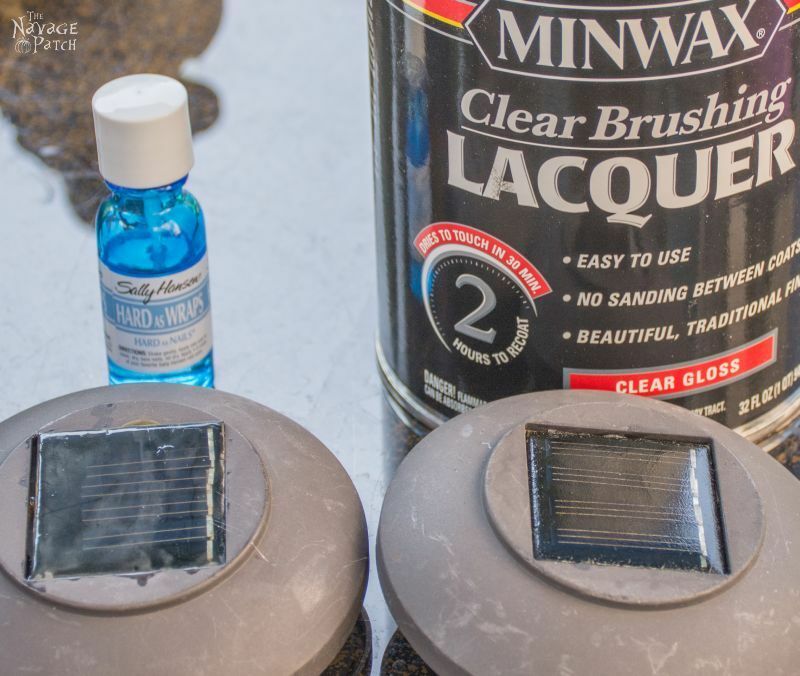 If you like solar garden lights, then you might want to try our DIY Waterdrop Solar Lights or DIY Spilling Solar Lights. 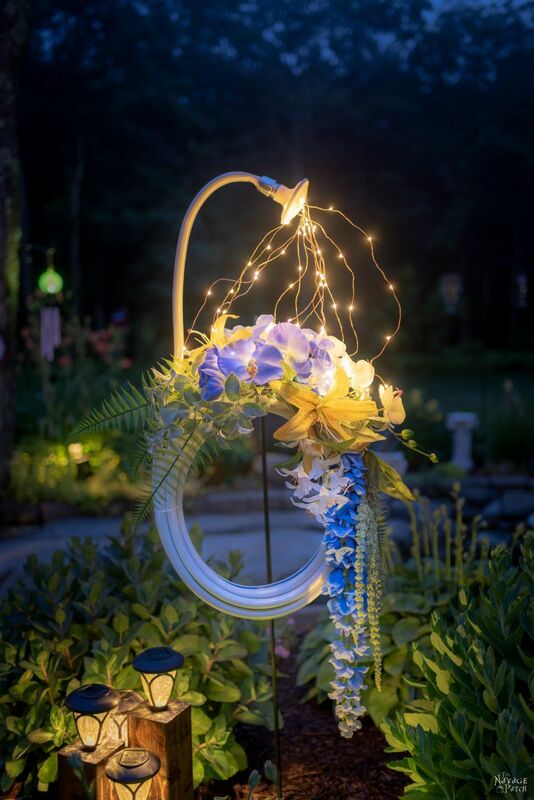 Or perhaps you’d like a lighted garden wreath. 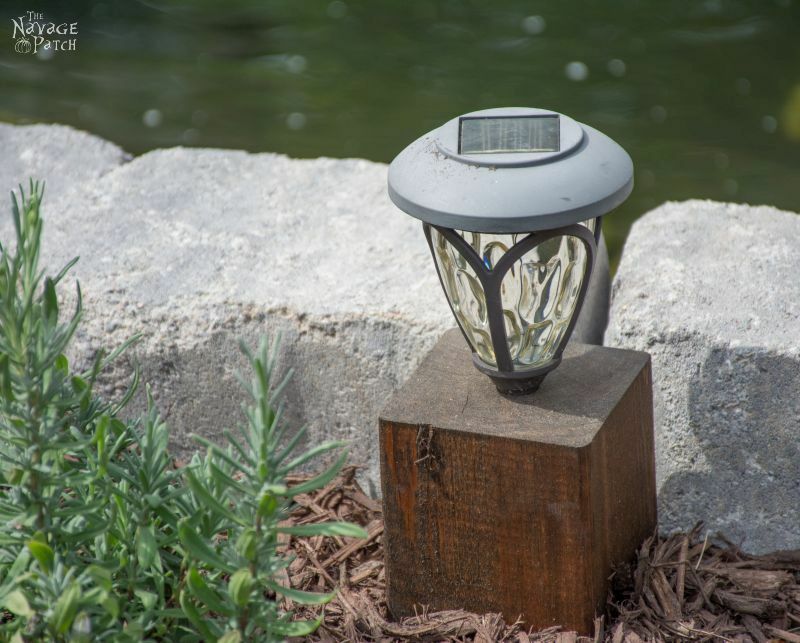 Click on the pictures below to see the tutorials of our most popular garden solar lights. Aw, man, are our vows up for renewal already? I feel like we just made them! 🙂 Handan is most definitely a project manager at heart, Giselle! You should see her in action! Really fabulous idea, love it! 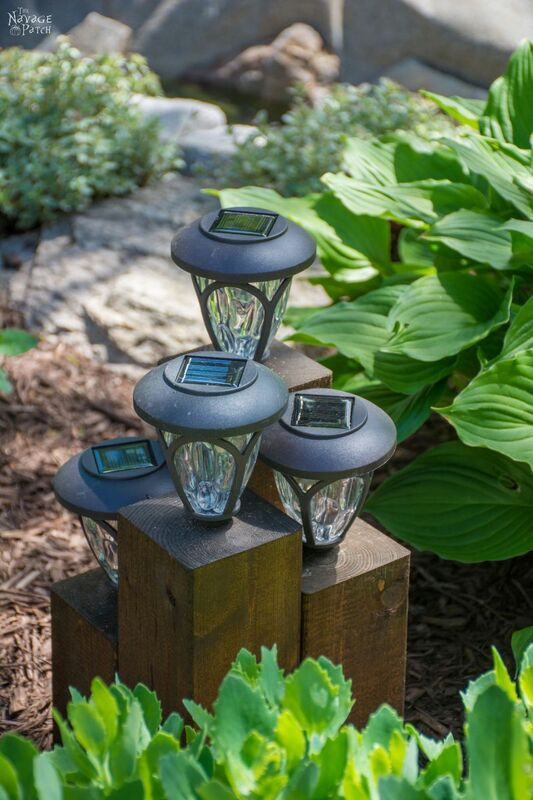 I have some solar lights stuck into planters and kids from the neighborhood keep playing with them, maybe something like this would be a great solution. thanks for sharing on craft schooling Sunday! I love using cedar blocks for landscaping ! 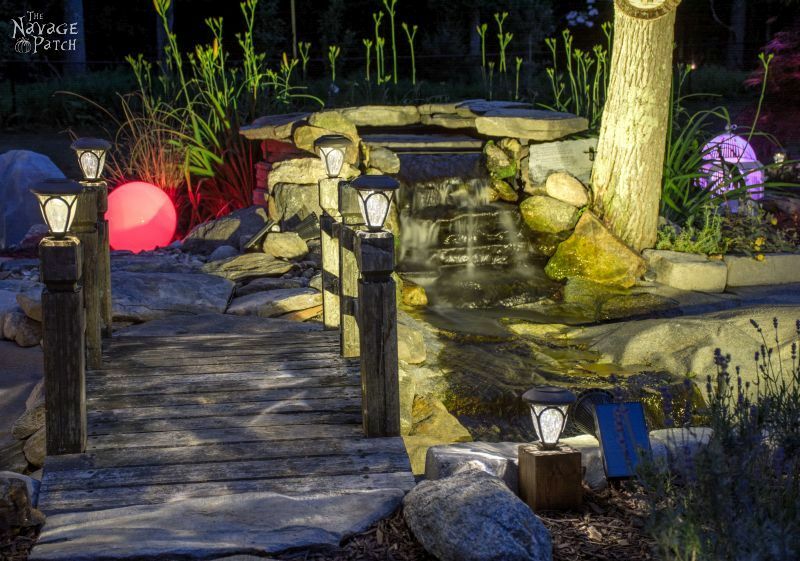 Your landscape lights are fabulous and so easy to do! Love them. Pinned to share. We appreciate you stopping by and sharing your wonderful projects with us each week at Snickerdoodle Sunday! The wood blocks look so much better then the spikes do. I’m properly impressed. I might even be tempted to go and get some spikes in the near future and try again. You are so funny relating stories, Greg!! I love visiting your blog to see what Handan and you create, and to have a good time reading. Thanks for sharing with us at Two Uses Tuesday too, enjoy the rest of the week! Thank you so much, Pili! You have a great week as well! These projects are amazing! Your comments alone are worth the reading. 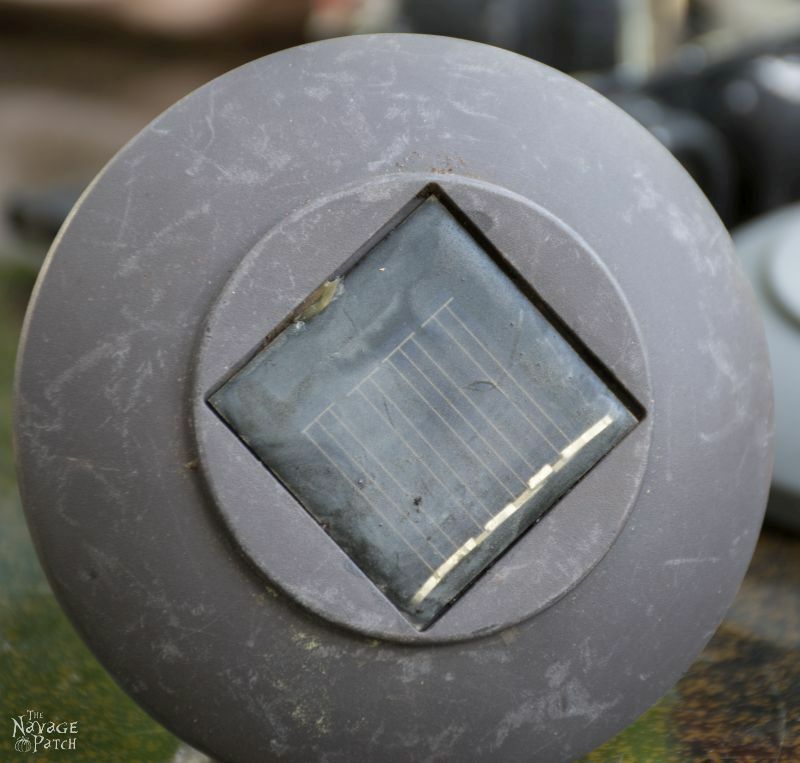 The solar light project made me start wondering….you know those fogged by age headlights lens on old cars (mine being one) are plastic aren’t they. Why couldn’t we clear them up using your method? I’m just goofy enough to try a small spot – what do you think? I keep old lizzy sparkling except for those headlights. Thanks for your blog, great fun! DeeCee. Love this idea!! I wanted to raise mine higher as they got lost when the perennials grew so all I did was pound a rebar pipe into the ground, cut a PVC white pipe to the height that I wanted, placed the pvc pipe over the re bar, took the spike out of the solar light but kept the metal piece, placed the solar light with the metal piece onto the top of the PVC pipe, threading the metal piece onto the rebar to stabilize it and ended up with solar lights about 2 feet off the ground and above my perennials!! Hi Deb, that’s a great solution you came up with! Yep, I use PVC pipe by itself. Cut to height, using an angle cut on one end to drive it into the ground easily. Paint desired color. I leave the lights spike in place and simply put it in the PV C pipe. 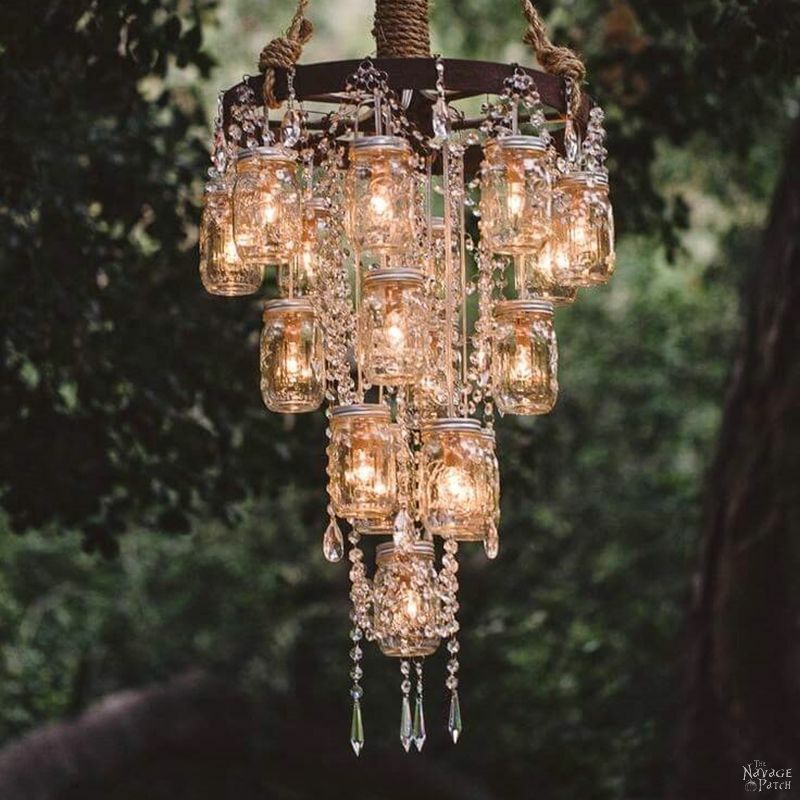 Really love this idea – so much more stylish than the spiked lights and we also love your sense of humour and writing style! Just informed my husband that we’ll be copying this once we have our garden under control – we moved here two years ago but the garden had been pretty much neglected for nine, as it was the previous owners’ second home. All the best from Devon, U.K. Thank you so much, Pam! I’m glad you’ll be making them. Send us a pic when you’re done! Your garden is magical, I would love one but I’m not physically able to keep something so labor intensive looking good, (no minion).???????? 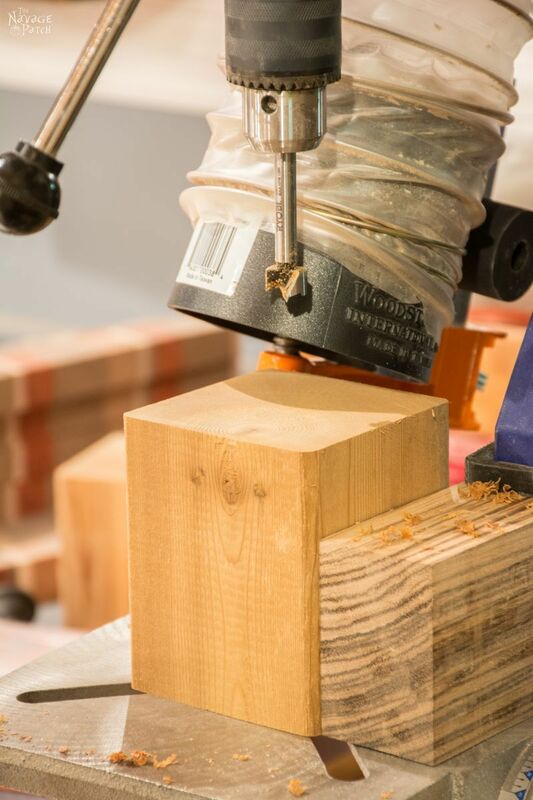 What were the lengths of the posts that you cut? The four-piece ones? Thanks, also will you be posting your instructions for the coiled copper wind chime? 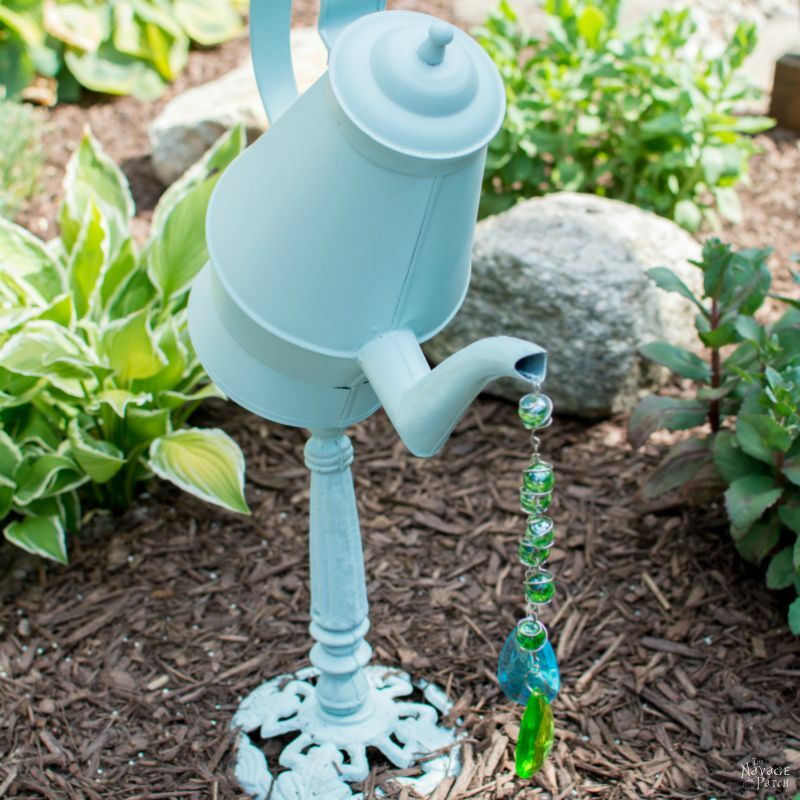 Hi Handan – was noticing your whimsical watering can – do you have a link for that as well! I have an old iron lamp stand, plus a few watering cans hanging around – would like to try and meld the two together to make something similar. Just looking for a jumping off point. Thanks! 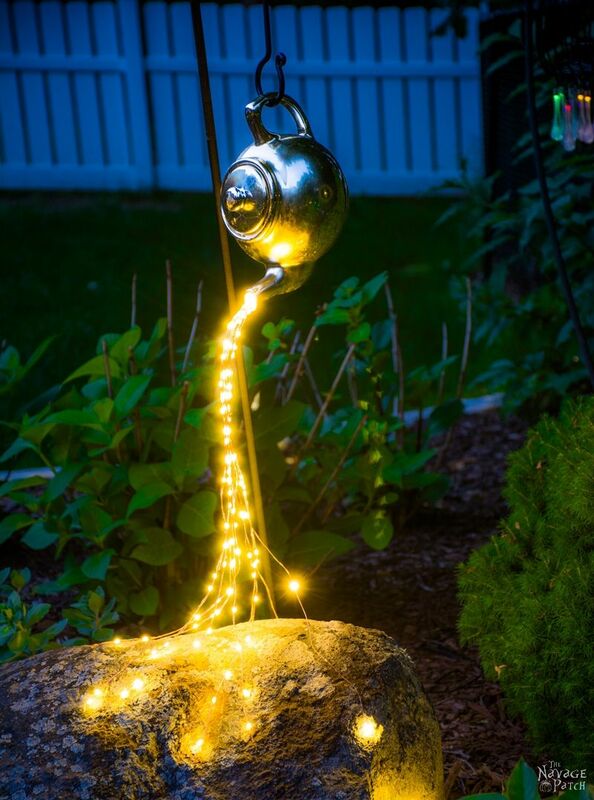 Here is the link for that post: https://www.thenavagepatch.com/diy-garden-decor/ The watering can decor is on the second page of that post. I hope all this info helps 😉 Have a great day! Hi Handen – again thank you so much for all the links. Can’t wait to do the fairy lights teapot. I’m wondering did you just put the solar panel behind the rock, or was it attached to the teapot somewhere? Thanks much! Love your creative mind. My husband has bought 3 sets of lights and the summer just arriving. 🙁 With your creative posted I will consider passing this great idea on to my husband. I have one question….are there spikes on those lights that are on the cedar? Thank you, Gina! No, the spikes and tubes are gone. There is a little nub at the base of the lights which would normally slide into the top of the tube….that is what goes into the cube. How did you attach the lights to the cube? 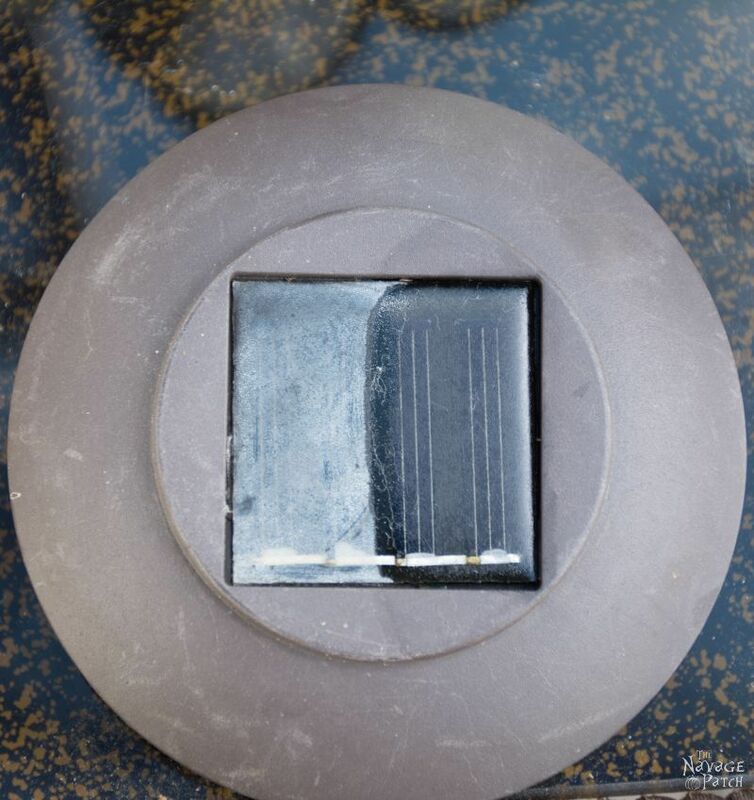 Hi Jan, the end of the light fits right into the hole drilled into the top of the cube. WOW!!! 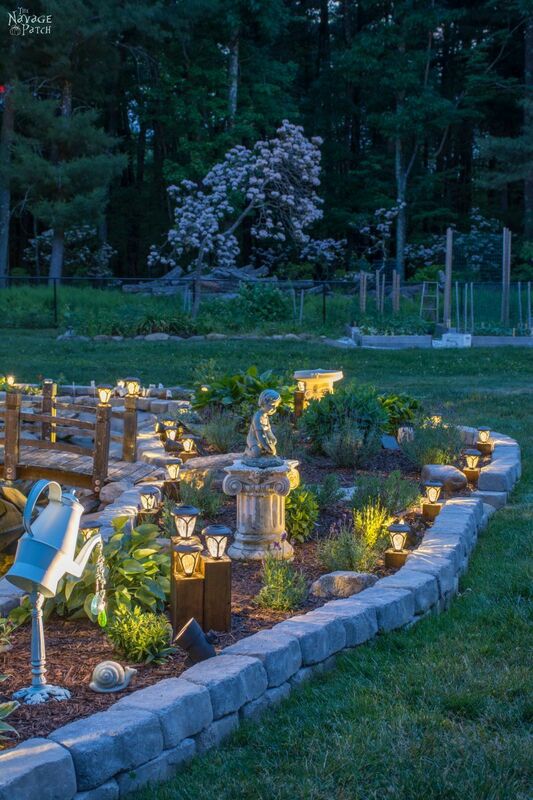 Love this-many times the lights need to be higher than the standard spike-to be accents, rather than edging…adds a whole new element of beauty and drama to the garden! Thanks for sharing! What is the height diff between the cluster of blocks? I love this project…so much nicer looking than the “crappy” tubes. Your garden looks fabulous. I especially love the old coffee server on a post with jewels stung together to look like water. Did you also make that? If so, do you have instructions for that? These lights are aresome! so creative! They look really nice in groups! Do the dogs not try to pee on them everytime they pass? Your lights look great, especially in groups! But I am wondering if the dogs dont use them everytime they walk by? What a creative idea! 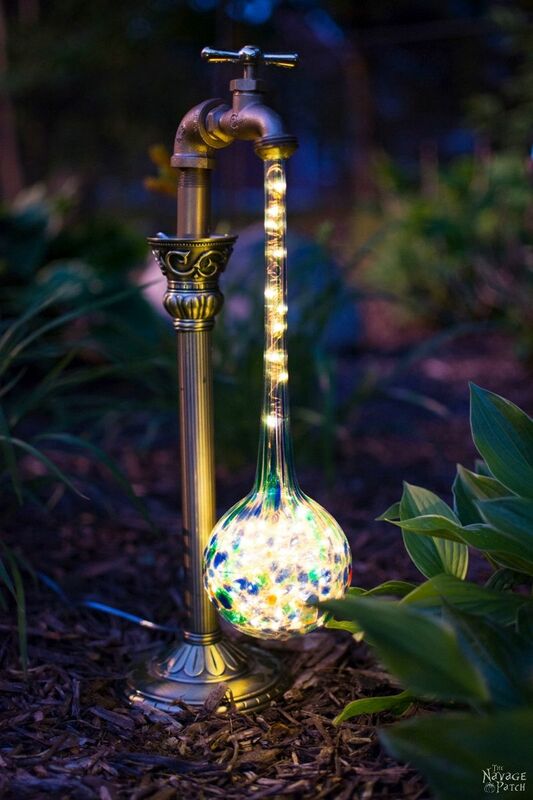 I’ve been looking for a project like this to really give my moon garden a pretty pop at night. Definitely going to give it a try 🙂 Thank you for linking up to Dishing It & Digging It this week! So much nicer than just sticking them in the ground! 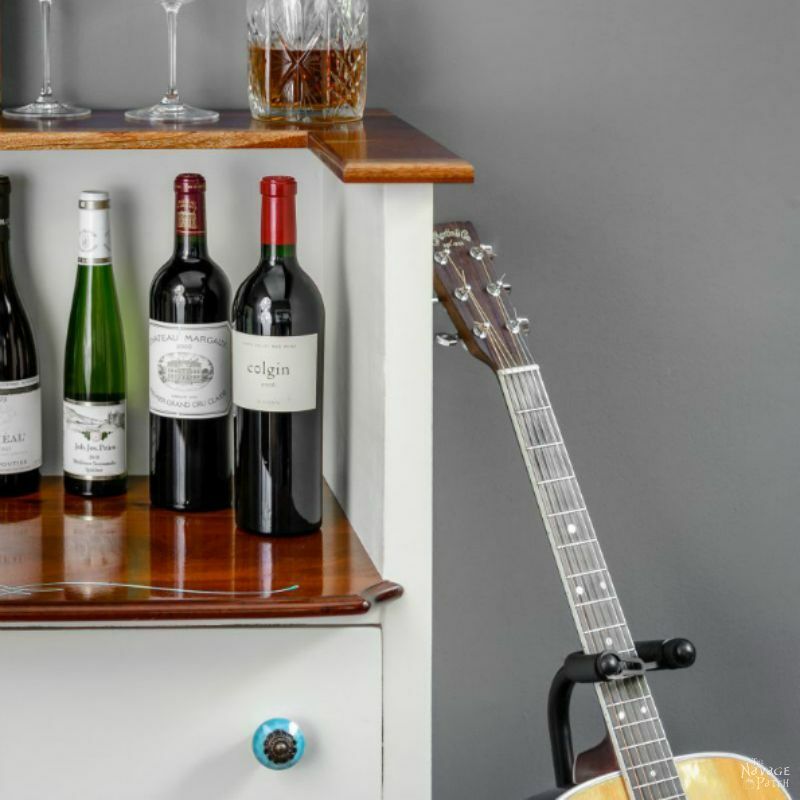 Thanks for sharing on the Pleasures of the NW’s DIY party! What a great idea! These would be great in my flowers beds or even just around the pool. I may just have to make me some. Thanks for sharing! Great idea, your garden is on of the most beautiful I have seen! Beautiful project and I love the way you write! Very cool idea! I’ve often thought about adding solar lights around our garden, but they are just so flimsy. I’m going to have to pass this idea along to my husband 😉 Thanks for linking up with Merry Monday this week! I sooo love these!! 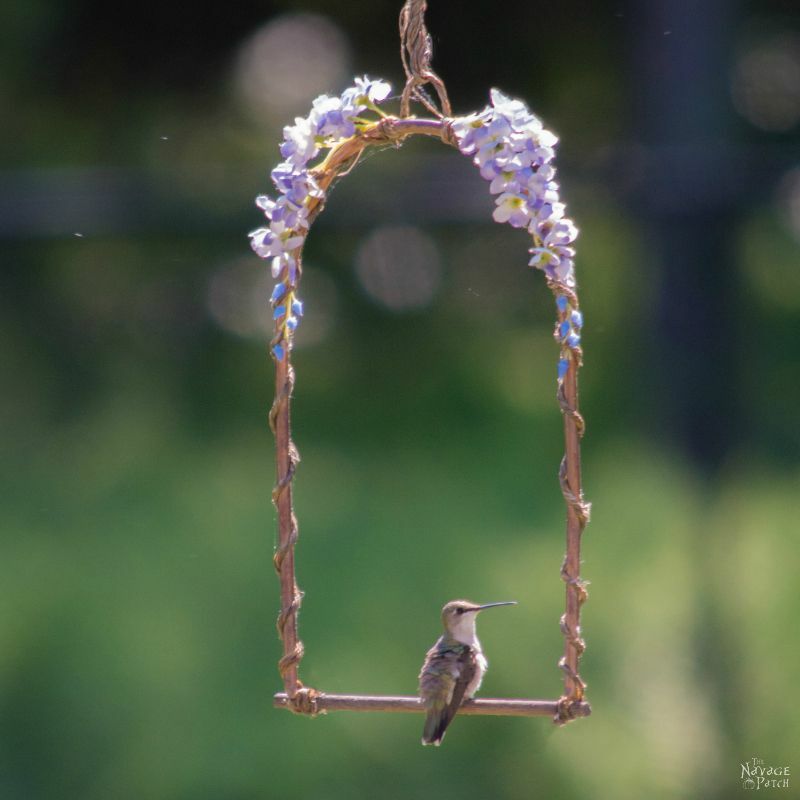 I noticed how amazing they looked in your backyard project, and was dying for you to share how to make them. Thank you so much for sharing this. I can’t wait to make my own. And thank for the tip on the lacquer. I used clear nail polish on my solar lights last year, and I had to reclean & reapply this year as it wore off in the elements. I can’t wait to try your tip on mine! Thank you so much for sharing to the Monday Mish Mash Link Party!! Thank you, Amy, and good luck with your lights! This post is packed with great advice. I don’t have near the amount of landscaping lights that you have, but I’d love to be able to use them for more than a year. The plastic posts are an issue, they either snap off or I have to dig into the bed, killing off plants, to retrieve them. This is a perfect solution and I love how you made them into multi level lights! They look great. Second, I am going to try your clear nailpolish trick. I have a teenage girl, so I’m pretty sure we have several bottles of clear nail polish hanging around. Can’t wait to try it. Brilliant! Since it did come up here…Would or could you use the Lacqure on your headlights to get them back to the way they were when new? Thank you, Linda! I’d be wary of using anything on headlights, as they are specifically designed to refract light in certain ways, and the lacquer could interfere with the intended refraction pattern. Thank you. I had a feeling not, didn’t hurt to ask. Love the blocks! We started using piece of 1/2″ conduit cut the right length and pounded into the ground. The light posts fit right over the top so no more problems with broken spikes in the ground. We live in the Rocky Mountains so most of the plastic posts that come with the lights didn’t make it through trying to pound them into the ground. Thank you, TJ! Conduit is a great solution, too. Anything but those awful plastic spikes! Great idea! Did you glue the lights into the cedar or are they just sitting there? I have a lamp post out front that doesn’t work any more and I wonder if something like your idea might work. What do you think? You have a new follower – keep up with your great ideas and thank you. Hi Jo – the lights are just stuck in there with friction. Thanks for reading and commenting! I LOVE your garden and the refreshed lighting is stunning. Thanks for posting start to finish. I love the trial and error comments also, it helps others decide on compounds ahead of time. Thank Your Minion and Spouse. You did a beautiful job. Greg, would this same technique work on those dang cheap headlight lens??? Thank you, Linda! Oooh, I’m jealous…Montana is beautiful country! Lovely! Great idea for those I usually end up buying new ones every single year ;( I’d be pleased if you visited my blog sometime and linked up your DIY’s to my new linky party, Support Your Fellow Crafter on Monday’s! Thank you so much! Greg omg unicorn poop! I have solar string lights and 1 string stopped working. I was thinking of trying the headlight restoration thing ,you know with the super fine sandpaper. I’ll try it and tell you how it goes. You sound like my husband,happy wife happy life. 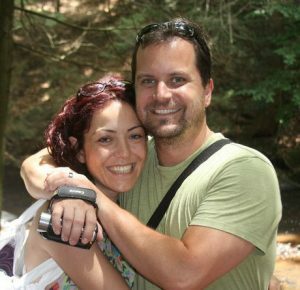 I’m thankful for sweet generous husbands like you. Almost peed my pants reading your blog! Thanks! Hi Joanne, that is a good idea! Much easier than pulling them all and then replacing them – especially for 3 acres of lights! Absolutely love this project! Greg, I love your writing. Hilarious. I laughed out loud on your millennial comment. Pining this for when my cheap solar lights bite the dust! Hi Kathleen, I’m so sorry for the late reply! Thank you so much for your comment! I love hearing that I make people laugh – it keeps me going. Thanks so much for stopping by, and I hope to hear from you again. You just saved from throwing out the majority of my solar lights. Over the winter they will get new posts and a cleanup with lacquer. This was such a well written article that I now have to go back and read all the ones I’ve missed. You and your wife make a lovely couple and your Dad attitude is right on. Wow, great timing! I’m so happy to help! I’m glad you found us, Karen – we look forward to hearing from you again! Your garden is beautiful and my dream! I have a few lights in my “hankie-size” yard that never make it a full season. But, I have kept most of them (you know, I’ll find a use for them one day) and ta-da here you are. 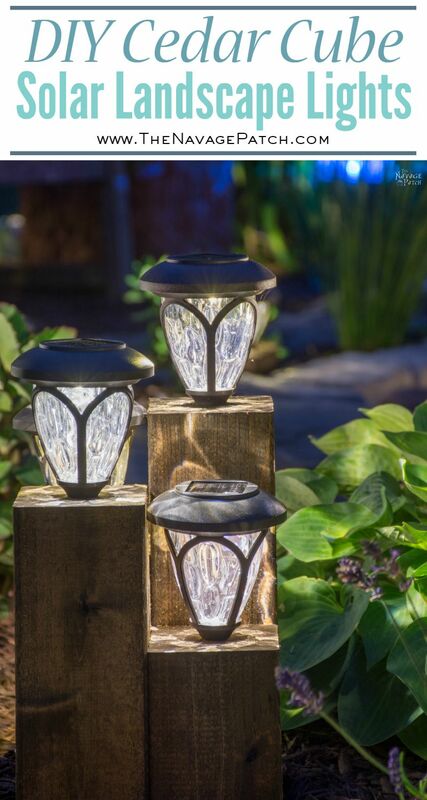 I purchased a decorative light item last year that is very similar to your cedar blocks, but they used landscape timber blocks and as added decoration, wrapped rope around the center of the timbers after they were connected. Can’t wait to get out and start painting with nail polish so I will have plenty of lights this year! Thank you so much, Paula! 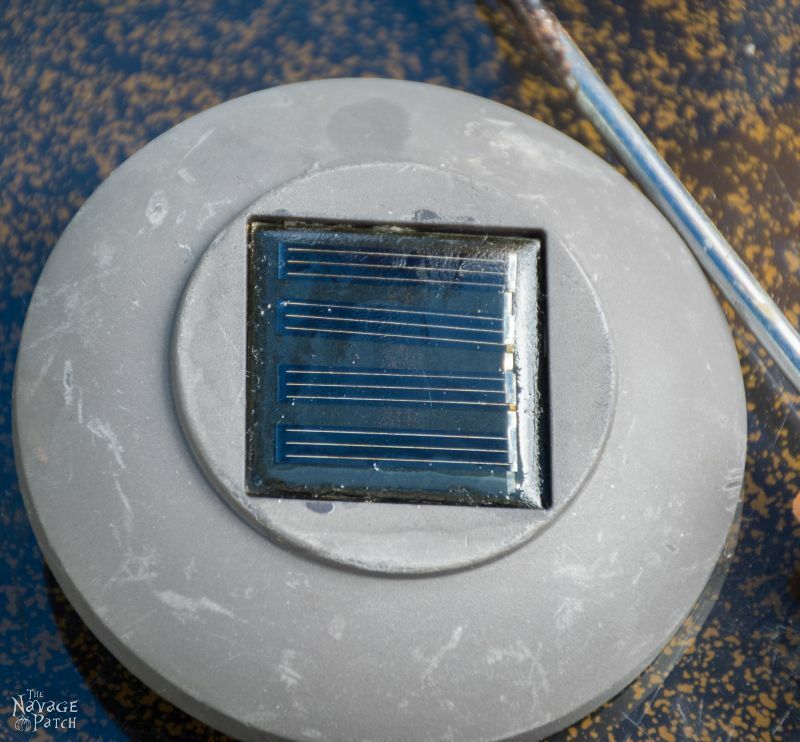 Good luck with your lights – I’m sure the nail polish will clear those solar panels right up! I also appreciate a keen sense of humor such as yours. Thanks so much!! I love your humor as much as ur project! ? How did you attach the lights to the post? Hi Betty, the lights slide into the holes I drilled in the cedar cubes and friction holds them in place. Really like several of the projects. I’m new to your site and it has some definite “must do’s”. Since this is my first time, what is the protocol to print one of these projects? Saw some free printable, but not the ones I would be interested in. I assume the others have a cost and that’s understandable. 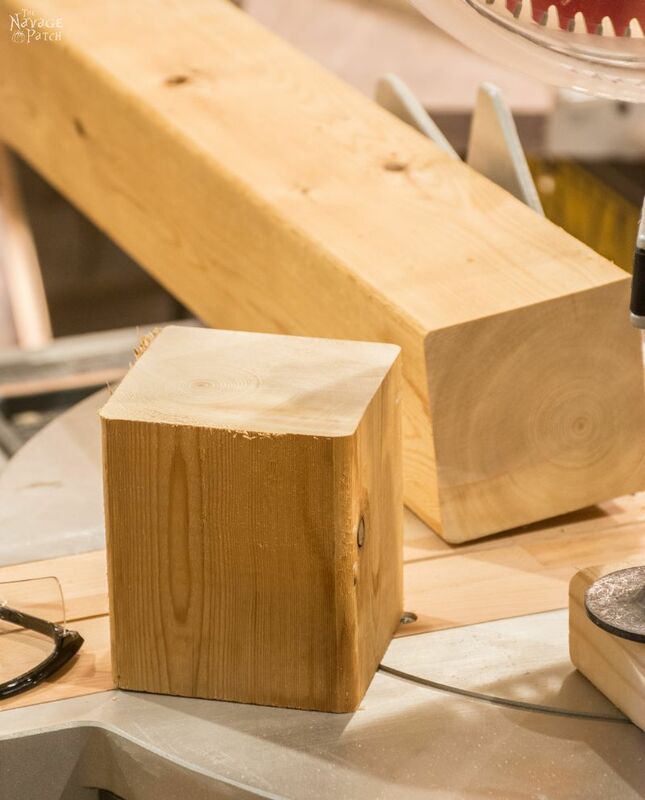 I’ll save the link to this cedar block light project, but many others I like…ahhh a summers worth of ideas + travel will keep me very busy..
Hi Mike – no cost on our site – everything is free. The printables you mentioned are for framing. But it sounds like you just want to print the blog post of certain projects you’re interested, is that correct? If so, you can just print the page (or pages) right from you web browser. 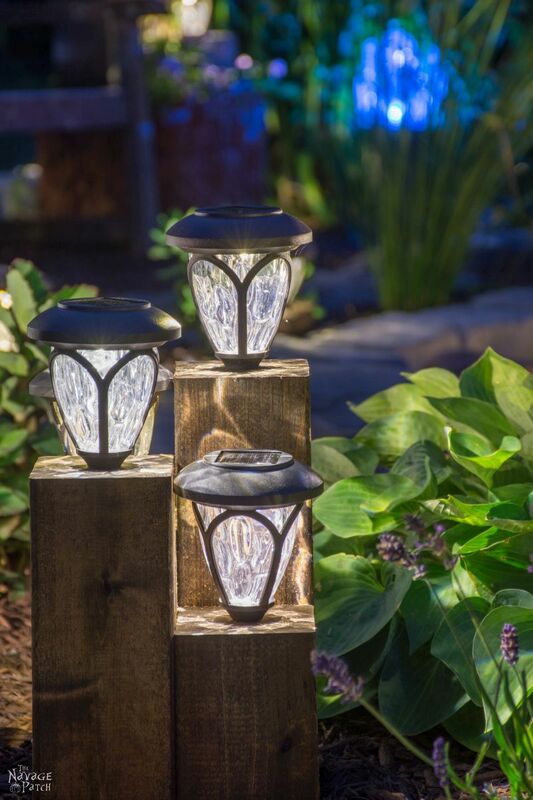 Wow what a beautiful garden you guys have, and thanks so much for the tutorial on how to make these great solar lights and also how to keep them bright. I have not gotton any solar lights because I see them broken and missing in other peoples yards and htey are so blasy blah to boot. I love things that are different and this is it! Also, I have noticed that some solar lights seem to fade over time. willl the nail polish trick end the fading/yellowing of the lights and is it ok to do this step when I first get my lights? Thank you, Pam! 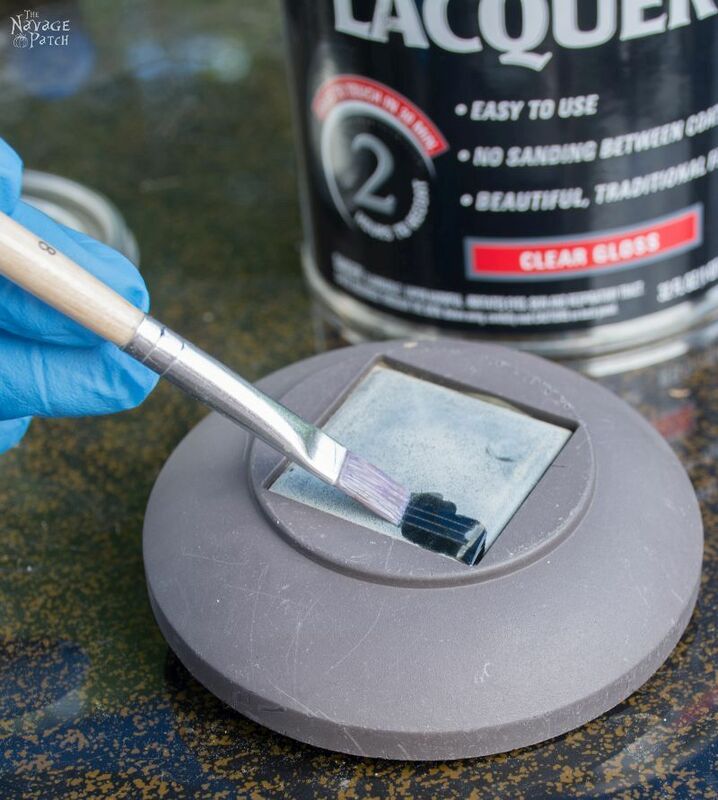 Yes, putting a sealant on when you first get the lights will help them last longer. Good luck with yours! I enjoyed reading your blog and the light project is great. I was wondering if you think putting an outdoor polycrylic sealer on a new solar would help preserve it and make it last longer? That’s a great question, Carol. Yes, a sealant will make them last longer, but I would use either lacquer or clear nail polish. Polycrylic may work, but the solvents in the lacquer and the acetone in the nail polish actually melts a thin layer of the plastic panel to not only help adhesion, but to clear up any haziness as well. My feeling is the the polycrylic would just sit as a layer on top of the plastic and tend to flake off over time. 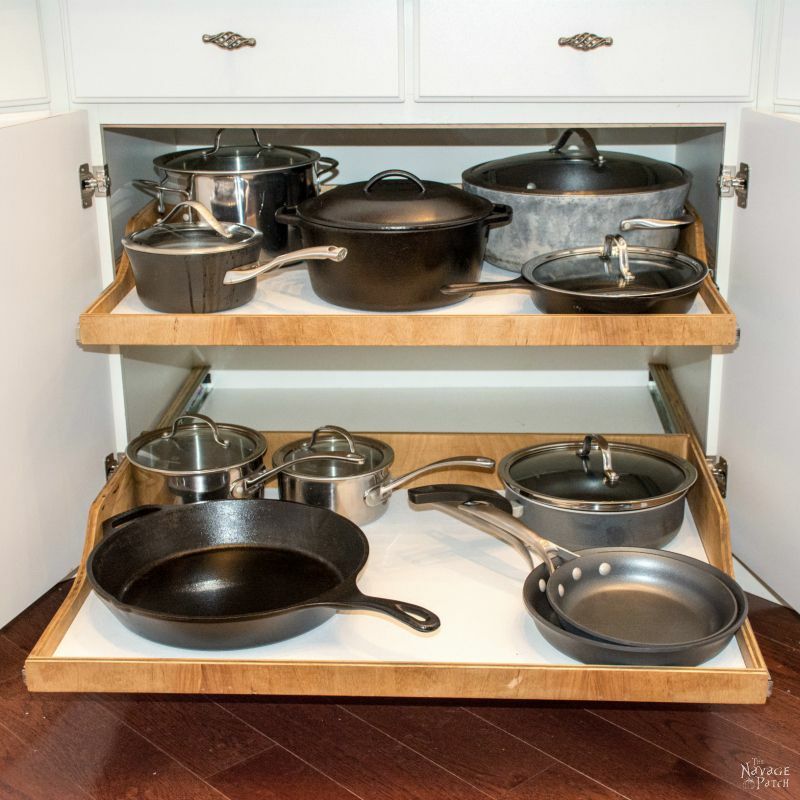 This is one of the best projects I have seen on Hometalk. It solved a problem, is esthetically beautiful and very useful. I probably would have just replaced the non functioning lights but you found a solution to the hazy light cell issue. Great job. Great project and all, but really you are a great writer. I usually skip through the paragraphs of blogs to get to the results at the end, but I really enjoyed reading the process this time! 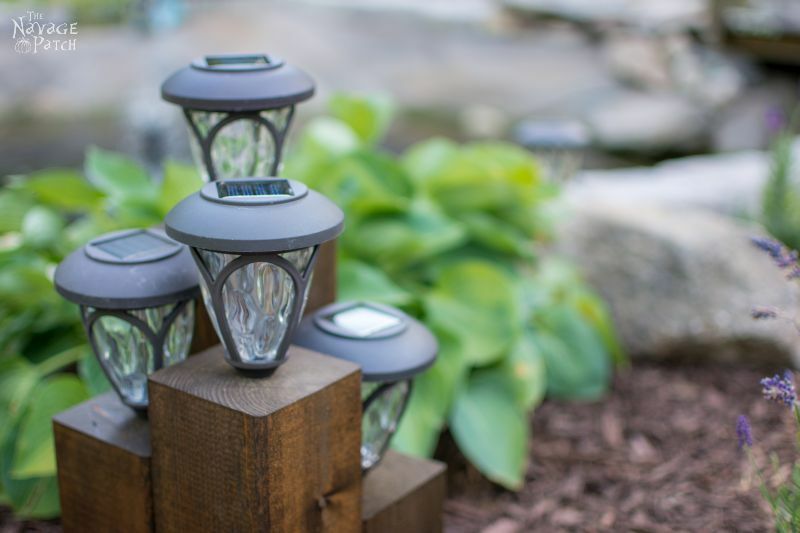 I agree with Amity … great project … we have no garden (and even IF we put our solar lights in/on cedar blocks, I’m pretty sure the lawn “care” guys would ruin those as well as they’ve ruined the 1st 3 sets I had around the cement patio/pergola area) but absolutely LOVED reading the post .. hilarious and informative at the same time. I’m still smiling. Oh my Lord you are absolutely hilarious! I LOVE reading about your escapades while doing your diy’s!! And on top of that your garden is absolutely stunning!! I currently just rent so I’m basically limited on what I can do but one day hope to have my own place nd can make it look even the tiniest bit like your garden! I absolutely love fairy gardens so am in the (slow) process of making over my don’t garden into a fairy garden and will definitely be using some of your solar lighting ideas!! Hi Cheryl, thank you so much! We’d love to see your fairy garden when it’s done! I have been all over the internet looking for that same light. I love it but it’s nowhere to be found. Help please? The exact lights we used in this post are no longer made. We bought them back in 2014 at Home Depot. They seem to change the design a bit every year or two, unfortunately. What great ideas. Absolutely beautiful designs. I am going to try some, I love retirement. 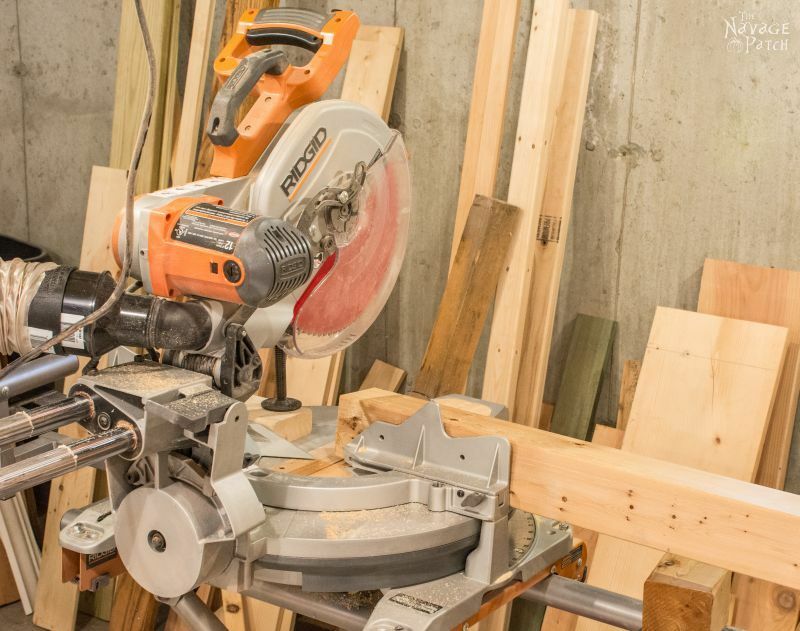 I am signing up for a woodworking class. Now, if they only had a creative class. Did you ever end up painting the plastic one it faded? 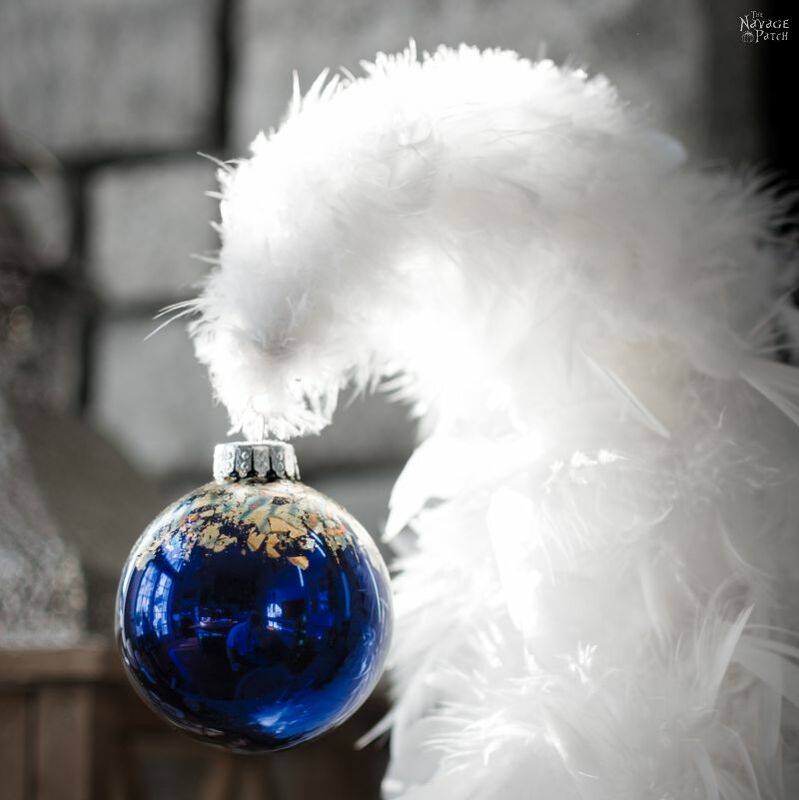 And, would it be wise to put the lacquer on when you first get the lights? Just wondering! Oh, and one more thing: canyou cut the lengh down if needed? Hi Christy, you can certainly paint them, though I’m not sure how long the paint would last out in the elements. 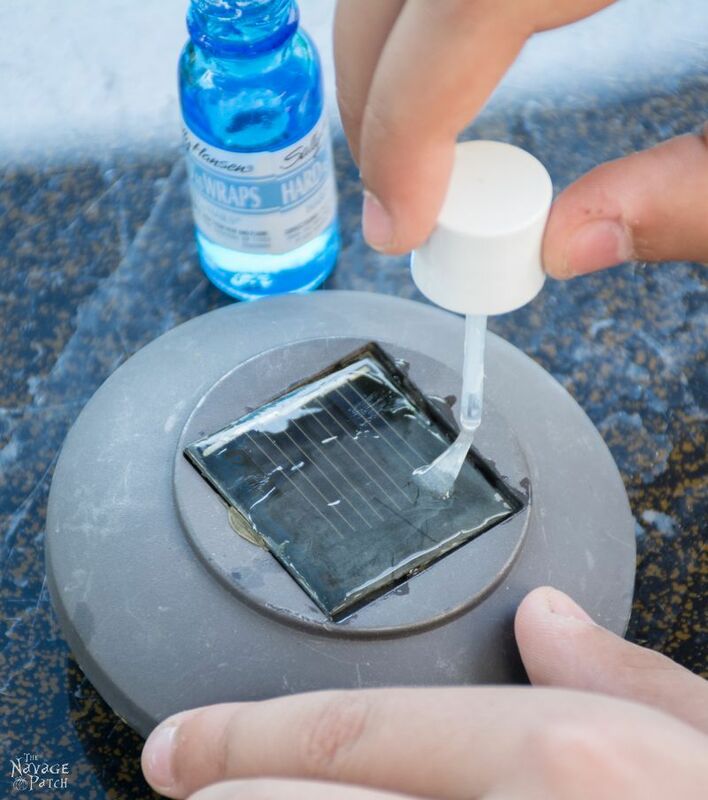 As for applying the lacquer to new solar panels – I believe that might make them last longer. I will have to try it on our next new batch. If you want to cut the length of the light posts, you’d have to do it very carefully, as the plastic is hollow and brittle. Could be done, though. Not only are you gorgeous, you are very talented,! Not only are you gorgeous and talented, I am wondering why you are not writing books???!!! That may be your even bigger talent. You have a wonderful way with words that makes a reader want more. If you have written a book, I would want to know because I would surely buy it. Wow! Thank you, Joyce – you just made my day! About that book…I just started one. Since it’s my first, I’ve no idea how long it will take, but I will surely keep everyone in the loop as the project gels. 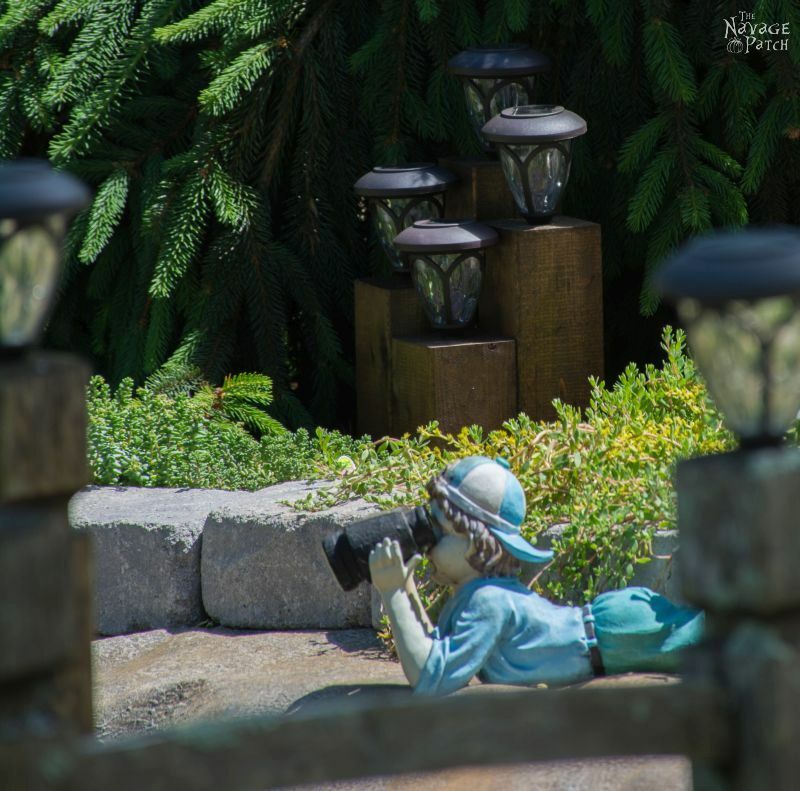 This article is hilariously written, great way to make light of an annoying situation lol 🙂 I’m going to do this, and your garden is absolutely beautiful! Bravo. Thank you so much, Rachel! 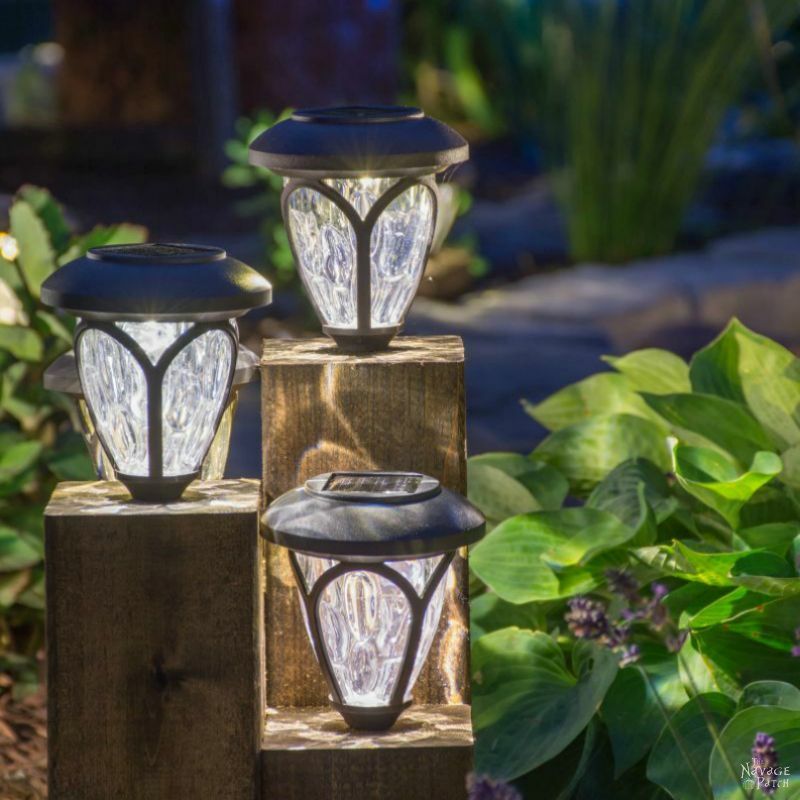 This is seriously the easiest garden light hack out there, but what a difference! I love the idea of the cedar blocks. Now that they have been in place for a couple of years I am wondering how they have been holding up? I worry about the indent you drilled and how rain water might collect there and age the wood quicker? Or is it just pretty inexpensive to replace them? Hi Conrad, they’re holding up great. A few have developed cracks or splits down the side, but they still work and they still look good. And yes, if needed, they are easy to replace!